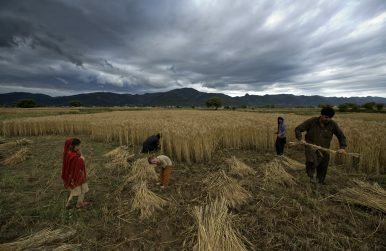 Family members of a Pakistani farmer harvest wheat crops in the suburbs of Islamabad, Pakistan (April 20, 2018). A lack of government planning could leave Pakistan’s farmers on the losing end of a far-reaching deal with China. The basmati rice grown in Pakistan’s Punjab province is long and slender-grained. It is aromatic, fluffy when cooked and, in classic Pakistani dishes, pairs well with lentil and gravies made from chickpea flour and spices. At market, it draws double the price, if not more, of non-basmati, long-grain rice varieties. In recent years, however, basmati revenues have slumped in Pakistan amid low-yield harvests and uneven quality. At the Sino-Pakistan Hybrid Rice Research Center in Karachi, Chinese and Pakistani scientists are working to reverse this trend. Using state-of-the-art genetic technologies, they are developing high-yield, high-quality, and pest-resistant rice varieties, for both domestic sale and export. The $1.3 million research facility is a harbinger of many changes soon to come to Pakistan’s agriculture sector under the ambitious development scheme known as the China-Pakistan Economic Corridor, or CPEC. A crown jewel in China’s continent-bridging Belt and Road Initiative, CPEC encompasses some $62 billion in investments and infrastructure projects in Pakistan, including ports, power plants, roads, and railways. For agriculture, CPEC promises technology transfers, infrastructure upgrades, and extensive cooperation between Chinese and Pakistani farming enterprises. Pakistani officials have struck a cheerful note, pledging all good things for the country’s landowners and farmers. But economists say similar rhetoric preceded ongoing CPEC projects in other sectors, which in fact became plagued byexploding budgets and bureaucratic delays when the time came for implementation. Farmers in Pakistan, for their part, complain that a lack of detailed publicly available information has left them in the dark as to what to expect from CPEC-related agriculture projects, as well as unable to verify what measures the government has taken to protect their interests vis-à-vis China. At a time when Pakistan has wagered future decades of prosperity on CPEC’s success, this lack of transparency — and possibly an overall lack of government preparedness — threatens to place the country on the losing end of an otherwise promising economic partnership. A June 2017 report in the Pakistani news outlet Dawn outlined the potential breadth of China’s plans for CPEC. According to the author’s review of a lengthy but confidential government planning document, it is possible Chinese enterprises will be allowed access to large tracts of Pakistani farmland, either by lease or purchase. On that land, they will allegedly be permitted to operate their own farms and processing facilities, backed by robust capital grants and loans from Beijing and the Chinese Development Bank. Thanks to low tariffs and increased transportation links between the countries, Chinese produce is already prevalent in Pakistani markets and competing with locally grown produce. But in the future, Chinese produce grown in Pakistan could potentially be exported to Chinese markets, with little benefit whatsoever to Pakistan’s economy. Agriculture currently accounts for 20 percent of Pakistan’s GDP but employs 43 percent of its labor force, more than any other economic sector. Despite the industry’s size, it has long been hindered by water scarcity, energy shortages, and poor post-harvest infrastructure, which results in about one-third of the country’s produce going to waste before it reaches market. That Chinese investment might remedy some of these issues is a sure benefit of CPEC for Pakistan, Bengali said. But he worries his country is prepared to give up too much in return. Timely government regulation could help promote greater equity in in Pakistan’s arrangement with China. Syed Asim Ali Shah, a landowner and farmer who has grown rice and wheat for two decades in Punjab’s Jhang district, said he would like to see performance metrics imposed on Chinese enterprises entering Pakistan under CPEC. In exchange for land rights, he suggested, Chinese outfits could be asked to demonstrate quantifiable reductions in soil erosion, for example, or significant water collection in arid regions of the country. No public debates have been held on CPEC in his area, though, Shah said, and he knows very little about what might actually come to pass. He worries CPEC will result in many farmers, particularly poor day laborers and subsistence farmers, being displaced. According to Fazal Abbas Mekan, federal secretary of the Pakistani Ministry of National Food Security and Research, additional measures the government might consider include: guaranteed value chain participation for Pakistani growers, meaning raw produce would be processed into higher-value products — by canning, pureeing or pickling, for example — before export to China; quotas for Pakistani labor on Chinese-owned or operated farms; and requirements that specific infrastructure projects be completed, such as post-harvest storage facilities, before Chinese enterprises are allowed to access Pakistani land. “Employment must be generated,” he said. “We should not just become a market for Chinese goods completely.” Mekan added, however, that the government was “late” in setting advantageous conditions for the country’s farmers and businesses. Experts agree that agriculturalists might not want to hold their breath for swift protection from lawmakers. A disconnect between Pakistani government entities, they say, has broadly stymied efforts to adopt a consolidated approach to CPEC. With respect to agriculture, specifically, a 2010 constitutional amendment that established agriculture as the exclusive responsibility of provincial governments has resulted in frequent misalignment between provincial leaders and the federal officials who carry out CPEC negotiations with China. Complicating matters further, nobody in the government has any way of ensuring consistency in leaders’ approaches to CPEC before and after elections. With Pakistani voters headed to the polls this July, the potential exists that shifting ideologies and constituencies could scuttle some of the preparatory work for CPEC that has already been completed. If some worry these bureaucratic hitches will be exploited, however, Jue Wang, a fellow with Chatham House’s Asia-Pacific Program, said they have in fact proven equally problematic for the Chinese, across CPEC development sectors. Wang added that China should not be mistaken for a particularly unified actor on this front, either. Though many teams of Chinese experts and workers have been dispatched to Pakistan to survey land and evaluate opportunities, she said these groups often represent a variety of competing Chinese private companies and state-owned enterprises, who are themselves arguing over who gets to benefit from CPEC. With such a diversity of actors at play on both sides, Chinese enterprises will likely choose to approach future CPEC endeavors with caution and the flexibility to adapt to market fluctuations, according to Angela Stanzel, a Senior Policy Fellow at the European Council on Foreign Relations. At the end of the day, Stanzel said, China seeks to tout CPEC as a positive example of what it might achieve in other Belt and Road-associated countries. While she said fears of a Chinese “takeover” in Pakistan are well-founded, based on Chinese ventures in other parts of the world in recent decades, Stanzel anticipates China will want to avoid the negative blowback it faced in some African countries for its heavy-handed approach to partnership. Which scenario will ultimately characterize Pakistan under CPEC — that of an “iron brother,” in the rhetoric of Chinese development assistance, or a subjugated dependent — remains to be seen, but Hasaan Khawar, a prominent public policy columnist in Islamabad, expects the end result will have much to do with how well the country’s leaders prepare. For now, Khawar regrets that Pakistani landowners and farmers remain caught between optimistic government “fairy tales” and paranoia-inducing speculation, with little reliable information and fewer opportunities for comment.